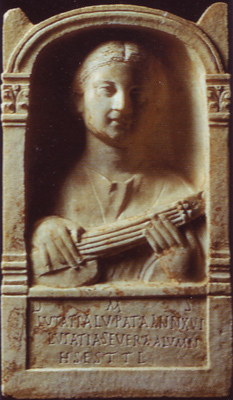 independent artistic language that led to the remarkable works of late antiquity. The enduring image of Rome represents one of mankind's greatest collective achievements. Reflected in imperial art from the accession of the first Roman emperor Octavian (31bc), to the deposition of the last, Romulus Augustus (ad476), it was continued by the Byzantine dynasties ("emperors of the Romans" until 1453). and revived at intervals in the medieval and modern Western world. During the reign of Augustus (31bc-ad14), imperial art - whether in the context of public celebration or in the form of portraits of the sovereign - imperial art was promoted at even,' social and economic level and exported to the most distant bounds of the empire. This mood of ideological fervour permeated the art of the entire imperial era. be seen today from Europe through to Mesopotamia and North Africa. At the heart of the continued reverence of the ideal of the empire by so many generations was the long-standing religious concern of the Romans to guarantee the survival and good fortune of their community through the scrupulous observance of divine will. Superstitious practices, threatened by the popularity in Italy of Epicurean doctrine, were modified for future centuries by Augustus, who translated them into loyal adherence to the images of the new regime. Out of the mythology inherited from eastern Greece, which had caused so much embarrassment to the rationalists, a few retained elements were sufficient to trace the essential historical origins of Rome and to rechannel traditional beliefs towards the new structures of imperial rule. These included the descent of the Julians from the goddess Venus Genitrix; the role of Mars, from the birth of Romulus to the avenging of the murder of Caesar; and the protection of Diana and Apollo in the battles that ended the civil wars. The task of the Chief Pontiff charged with religious functions was to preserve on the basis of these beliefs the "reciprocal link" (religion) with the gods rather than to expound the nature of the divinities. 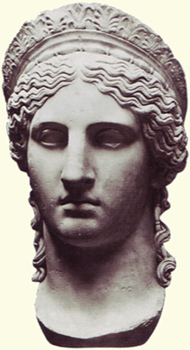 The past was reinterpreted as the forerunner of the history of Rome by writers such as Livy. who began with Aeneas and continued with the achievements of the Romans in accordance with the will of providence. In reviving the forms of worship necessary for the maintenance of the state, the leading personage of the governing class evoked the moral aspect of ancient religious zeal, adapting it to popular philosophical attitudes. The portraits of Augustus embodv the heroic and the divine aspects of the "actions" (res gestae) of the man who performed them. Crossing the "city of marble" from the Palatine to the Capitol and the Campus Martins, one is surrounded by buildings and monuments that culminate in the Mausoleum of Augustus, where the apotheosis of the Emperor fulfilled the legend of his origins: the entrance to the mound was in line with the Pantheon, the place where Quirinus, at Rome's beginning, ascended to the skies. Virgil's Aeneid projects the message into the future. 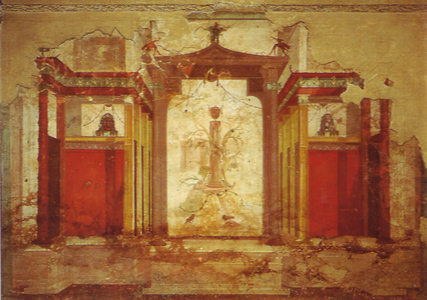 The Ara Pads, the altar set up to commemorate the rule of Augustus, transmits the tidings of messianic investiture and discloses the eternity of Rome, as do the Carmen Saeculare (a choral lyric) of Horace and the fourth Eclogue of Virgil. Henceforth, no public monument would fail to reflect in the actions of the heroes being portrayed or in its allegorical decoration faith in the sacred, everlasting essence of Rome. Marble bust of Octavian, Fondi. Certain motifs from the Hellenistic-style imagery of Octavian remain in official portraiture created after 27bc, when he was honoured with the title of Augustus. However, these Greek influences are tempered by the Roman preference for specific detail in portraiture. This is typified in the impressive marble statue of Augustus from Prima Porta, dating from after 17bc. which although based on a classical model has been modified in order to capture the actual features of the emperor. In Greece, among the many conventional images, there is an extraordinary bronze statue, depicting Augustus on horseback with military and religious attributes. Among these can be seen the sheath of his sword and the lituus (a staff used for divination) of the augurs on the mount of his ring — Augustus was appointed Chief Pontiff in 12bc. His neck is long and the fringe of hair is typically forked above the brow us in the earlier portraits. The bodv is thin under the mantle, the face is bony, and the skull irregularly broad. An air of defiance is suggested by the prominent chin, the lips pursed by the nervous contraction of the cheeks, and the tension in the eyes. The memory of youth contrasts with the harsh truth of a man in advanced age. The principal representation of Augustus and other images of him are cast aside by the artist, who shows the disturbing truth, far removed from the image favoured for propaganda purposes - the signs of an unhappy adolescence, the mental turmoil of an ageing man who, behind the unyielding mask of power, never reached full maturity. from the northern Aegean, bronze. Octavian, renamed Augustus in 27bc, originally lived near the Forum but later moved to the Palatine, where he bought the house that belonged to the orator Hortensius. After the victory over Semis Pompeius (36bc), he purchased nearby buildings and had them demolished, donating the land to the state for the Temple of Apollo. On the ground floor of his house, in the western sector that was intended for private use. the decorative paintings of the so-called Room of the Masks still appear remarkably fresh and bright. The walls represent, by means of skilful illusion, the outlines of a theatre stage. The structure appears superimposed on the permanent background of stone, which is enlivened by recesses and projections. The central area reproduces the painted fabric curtain covering the door to the stage, with a reference to the work being performed. On the western wall is a sacred landscape that alludes to a satirical play. The horizontal lines, which in reality come towards the foreground, converge at a vanishing point set at the eye-level of anyone entering the room, in accordance with the theory of geometric perspective outlined by the Greek philosopher Democritus in Aktinographia. Equally rigorous rules applied to the depiction of shadows. In this "second style" decoration of the House of Augustus, perspective of what was much later termed the Brunelleschi type was generally superseded by a system of different viewpoints for the three horizontal sections (plinth, central fascia, and cornice) of the wall. In the Room of the Masks, adherence to the theoretical model is attributed to a painter from the court of Cleopatra, who followed the victorious Octavian from Alexandria (28bc). from the Room of the Masks. During the period from Sulla to Caesar (c.90-40bc). artists in Rome from the Greek cities of southern Italy and Sicily had concentrated on the revival of parts of ancient Greek culture. This trend culminated in the Ara Paris, or Altar of the Augustan Peace, erected in 13bc to celebrate the era of prosperity and security during the rule of Augustus. The sculpture, which blends Hellenistic influence with the universal message of Periklean Athens, is an Italic-style realistic-record of the consecration ceremony and was dedicated on 30 January, 9bc. It shares the same formal treatment as Phidias' Panathenaic processional frieze in the Parthenon. On the northern face is a procession, perfectly ordered by family and rank, of the principal figures: priests, augurs, lictors (attendants). Octavian, flamens (priests). Agrippa, the young Cains Caesar, Livia, Tiberius, Antonia Minor and Drusus with their son Germanicus, Domitia and Domitius Ahenobarbus, and Maecenas. For many centuries to come, this composition typified dynastic propaganda. The arrangement of acanthus scrolls crowded with small animals beneath the figures brings together patrician traditions and the new order of the principate. On the eastern face of the monument Aeneas is shown as the founding father, whose family tree is traced by the tendrils. These were the noble branches of an ancestry rooted in custom. The hypnotic rhythm of the plant spirals changes for the sudden halt of the procession at the entrance to the enclosure, enabling the participants to gather up their robes or turn round, while a cloaked figure in the background, a symbol of winter, places his finger to his lips to impose holy silence. members of his family, priests, and officials. 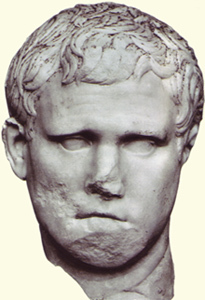 From humble origins Agrippa became Augustus' most competent general and admiral. Augustus entrusted the continuity of his ideas to forms of unquestionable beauty. Since Rome appears as the magnified projection of the predominant Greek city-state, its archetype was the Athens of Perikles. The Hellenic figurative tradition was acknowledged most of all in the decoration of civic and religious buildings in Rome. A law was even proposed (but not approved) by Agrippa. Augustus' son-in-law, whereby all original Greek works of art transferred to Italy would be exhibited in public places. Appreciation of Rome's heritage was guaranteed by classicism. which tempered the acceptance of Hellenic experiments. With craftsmen working to specific models, they were conforming to a single will, taking pride in being part of a collective enterprise, the allegorical transformation of Rome, which conferred upon Augustus the character of Supreme Being. 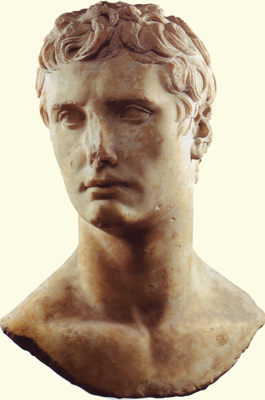 In the official portrait of the princeps, to which the title of Augustus was added in 27bc, the facial features were adapted to meet the rules of classical statuary and the hairstyle made to resemble those of the heroes of Polykleitos. For the court and the citizens in outlying estates and provincial cities who were following the example of Rome, workshops of Athenian sculptors were recruited to provide copies of the most famous originals by Greek sculptors such as Myron and Lysippos. This became the most popular way to furnish a house or villa. Some artists moved to Italy and supplied a wide range of casts, a selection of which were added to Rome's growing collections. The most famous masterpieces of the moment were copied although it was hard to capture the poetic spirit of the original: the final result depended on the ability of the artist to imbue his copy with some of the original's vitality and energy. At Baiae, one workshop possessed the moulds of dozens of famous works from Athens, from which it turned out statues and bronze herms, monuments with a square shaft bearing a bust. Many of these statues were found in the Villa of the Papyri at Herculaneum where, along with images of the owner, the heads of philosophers stood side by side with the busts of warriors and the likenesses of heroes, such as Achilles and Pentesilea, and divinities including Minerva, Apollo, Diana. Hermes, Bacchus, and Herakles, In wall-paintings, known as the "second style" (according to the four Pompeian "'styles"), architectural forms created an illusion of space, at the centre of which were reproductions of Hellenistic masterpieces showing mythological scenes. 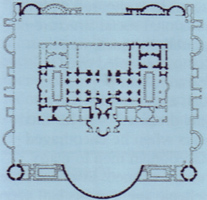 Plan of the Baths of Diocletian, Rome. of the Baths of Diocletian, Rome. built between ad298 and ad306. During the imperial period, the popularity of the public baths signalled a reversal of the trend of the late republican age when privacy had prevailed. The lavatrina, a small room for private ablutions in houses, was replaced by communal establishments. The balaneia or public baths which originated in Sicily and Greece, offered hot water and steam baths, using a system of hot air passed through underground pipes (hyperkausterion). The hygiene value of this system was emphasized in the .sanctuary of Epidaurus where the original Greek system was supplemented by new structures in the Roman age. Initially, the public baths built in Rome were known as balnea (third century bc), and then thermae, still of Greek derivation (thermos meaning "warm"). The baths were regularly inspected for cleanliness and temperature: later, these inspectors were called curatores thermarum. The Romans were inspired by the Greek combination of baths (loutra) with gymnasiums and soon had special areas for physical exercise. The Baths of Agrippa (19bc) were built on a monumental scale, complete with a park and a vast swimming pool. The Central Baths of Pompeii (still incomplete in ad79) were based on the precepts of Vitruvius, the military engineer and author of De architecturea. One of Nero's architects introduced the axial and symmetrical plan (ad62), later developed by Apollodorus of Damascus in the Baths of Trajan, where a separate section was provided for cultural activities with Latin and Greek libraries and rooms (auditoria) for lectures and conferences. 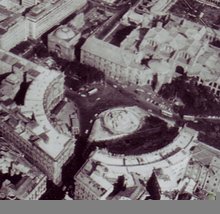 This plan became even larger in the subsequent urban complexes of Caracalla and Diocletian. As visitors followed the ritual sequence of changing room, gymnasium caldarium (hot room), tepidarium (warm room), and frigidarium (cold room), the could enjoy the statuary and decoration, which included a manner of subjects: athletes, nymphs, the Bacchic dance, Venus rising from the water, and the beneficent divinities. In the words of an anonymous epigram: "Baths, wine, and love corrupt our bodies. But thev are life." 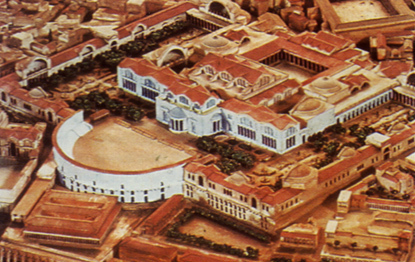 detail of the model of ancient Rome. The dissemination of the imperial message was reminiscent of the reign of Alexander the Great (356-323bc). The conquests of Rome rivalled those of Macedon in terms of territorial gain and promised even greater stability. The link was made by the consecration of the bronze supports of the tent that Alexander had taken on his campaigns in the temple of Mars Ultor. However, it was made clear that the Roman Empire shared nothing, nor bore comparison, with any Greek monarchy: this illusion had been dispelled by Caesar. When the young Octavian visited the founder's tomb in Alexandria, he refused to look at the remains of King Ptolemy, declaring that he had come to see a king, not a corpse. Rome had subdued the kingdom of Macedonia and all the others derived from it, in order to reassume the universal destiny of Alexander. The long-established strategy of forming contacts was replaced by annexation, an integral form of rule in which Augustus' image was replicated everywhere, as that of Alexander had been, as the living embodiment of the all-embracing empire. Artists, with their responsibility for perpetuating heroic human faces and deeds, were part of culture, and as necessarv as lawyers, doctors, and state officials in safeguarding humanity. One outcome of the Roman vision was that Greco-Latin culture was made tangible and lasting in the form of monuments. Architecture, painting, and sculpture took on a role comparable in society to that attributed to Greek philosophy. Aristotle held that logic was the foundation of reason and central to all discourse, even it the conversation turned from fact to persuasion: in Roman treatises it was the practical outcome of eloquence that became the highest expression of intellectual activity. Artistic production was a "demonstrative discourse", entrusted to specialists whose task was to immortalize collective functions and ceremonies or individual services. The end of the class struggle and the civil war helped bring a new sense of cohesion to society. From the time of the early kings to the middle of the republican period, conflicts among patricians and plebeians had emphasized the contrast between native art and works intended for an aristocracy that was cautiously receptive of Hellenic models. Now it was difficult to isolate "plebeian" art in the historical sense of that social class. By the time of Augustus. Rome had already established an equilibrium between both factions, resulting in a more uniform structure of government. 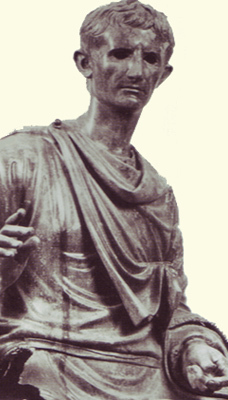 Augustus chose to revive the title of "tribune of the people", which would render inviolable his own person and his right to pass laws. Restoration of internal peace after the final defeat of Mark Antony had removed the most serious threat to Roman unity. Official planning gradually yielded to private patronage, the living standards of the middle class improved, and purchasing power mushroomed. The general mood was one of harmonious celebration. Romans had always found reassurance in the purpose and content of their monuments, which tended to vary in form according to the public level of cultural sophistication. The new factor, as compared with the traditional social structure of republican times, was that Rome now ruled over a cosmopolitan population such as Alexander had only dreamed of in his final years when he encouraged Macedonian men to marry Persian women. Ever since the Hellenic age. Greeks had been amazed at the custom of the quirites (Roman citizens) of granting citizenship to freed slaves and of allowing the sons of such slaves access to the magistracy. The father of the family could likewise free his foreign servant to make him his equal. Every Roman could thus create new citizens, investing them with prestige and power, and helping to formulate a mass culture more complex and comprehensive than that of Alexandria. To the multitudes, with their basic representative needs -votive offerings, portraits, and funerary monuments - was allotted that element of Greek culture which had already permeated Italic culture and plebeian art: socialist realism. This was not so much promoted by the people as offered to them like "bread and circuses". The combination of simplicity and Greek influence can be seen in the figurative decoration of commemorative monuments, a form of public art implemented by the state. Originally, there had been the triumphal painting of the republican age, on huge canvases, illustrating the actions of victorious heroes. These were much more likely to influence the collective mind than any easel painting, rather in the manner of modern-day billboards. In the celebratory relief of the imperial age. state policy still indulged the popular partiality for story-telling, combining clear narrative with spectacular rediscovered Hellenistic devices. Over time, the Roman manner of depicting history became so entrenched in the social imagination that up until the age of medieval Christianity, it came to be seen as the only way of presentation, and was almost second nature, part of the visual experience of Western civilization. No matter how Roman citizens of every extraction might differ privately in the choice of other forms of art, they were united in their positive reaction to the omnipresent propaganda of the Empire. 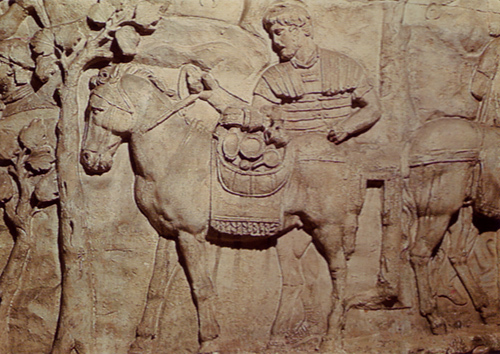 showing a soldier loaded with mule loaded with booty. drapery of a colossal statue of the imperial cult. As Seneca declared in his Apocolocynthosis ("The Pumpkinification of Claudius"), an irreverent comment on the deification of the late Emperor, the step from the sublime to the ridiculous is a small one. Characteristic of the Roman world, clientes (or freedmen) were literally the plebeian followers of the patricians, who gave service and loyalty in return for protection. The career of a rising politician depended on the number of clientes he had. so maintaining them was regarded as an economic investment along with property. The freed slaves became citizens and remained followers of their patronus (manumitter). Even in death, they continued to enhance the patricians prestige, with their funerary monuments lining the roads outside the city, which bore inscriptions proclaiming the bonds made through manumission. During the time of Augustus, Luni marble replaced travertine stone for these sculpted portraits. Cutting off the figure at the base of the chest was a legacy of the Etruscan tradition. Busts were sculpted in deep frames, as if they were facing outwards from inside a window, from the tomb towards life. Family members were placed close together or shown in embrace. Customs governing the public image were once again controlled by rules that had been blurred at the tempestuous conclusion of the republic. Augustus ordered the wearing of an unusually large toga as a sign of a civis romanus and this style found keen acceptance among the freedmen who could thus assert the privileges they had won. Children born of a freedman after his manumission were free of all special restrictions and the son of a freedman gained the right to join the army. Alongside representations of toga-wearing men and women wrapped in mantles were the citizens in arms, in the heroically nuked pose of Greek derivation. The number of individuals represented, including those still living, and the size of the monument, constituted a metaphor of pride and hope for the growing family. The figures vary greatly: each one has a story to tell: it is a record of the past and a model for the future. For example, the gestures of the married couple in the Gratidii group tell a love story. The static, frontal representation of individual faces derives from Italic tradition, but the overall composition has elements both of classical nobilitv and Greek sentiment. Rabirii group, Via Appia, Rome. 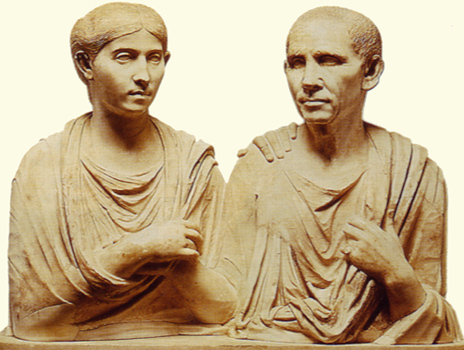 From the reign of Augustus, the wearing of the toga became increasingly popular. The balteus, the sweep across the chest, became looser with a tuck in it (umbo); another fold of material (sinus) hung at knee-level. 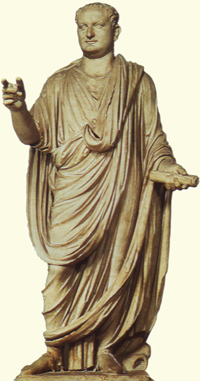 In the marble statue of Titus (ad79-81), which came from the Lateran Palace, the line of the drapery runs from the right foot to the left shoulder, over which the end (lacinia) falls. The shadows are so dense and the folds so fine that it resembles a work in bronze. The artist has combined the emperor's coarse features with an elegance achieved through the delicate carving; which in the skilfully rendered folds reveals the pose of the body beneath. The large head is modelled with incredibly light touches. The small, rather disquieting eyes are surrounded by tiny wrinkles and framed by a square face. The smile on the prominent mouth suggests both sensuality and amiable optimism. Near the left foot lies a wasp's nest; this is a reference to Titus' grandmother Vespasia Polla, who derived her name from the insect, vespa (wasp), and from his father's surname Vespasian. The log. inside which is a honeycomb (favus, another phonetic allusion to the family name Flavius), serves, therefore, not merely as a physical prop: it is his family tree.